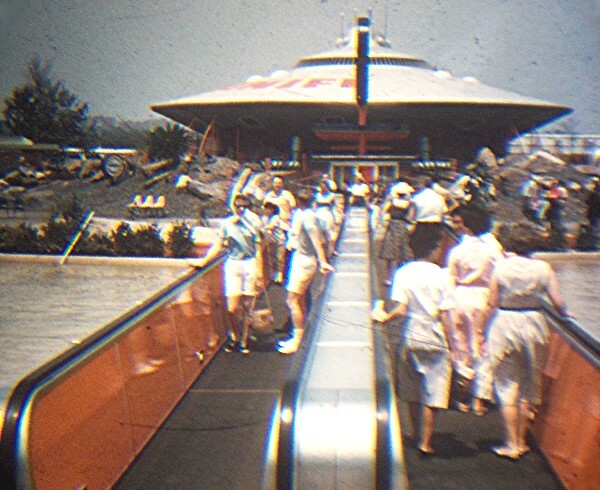 Looking at this made me think about the space trip show at Freedomland. Here's a shot that shows some similarities, such as the guard booth on the left and chain link fence. Of the two, which would attract your eye the most? No wonder Disneyland is still with us and Freedomland is but a memory. Exactly. The Freedomland attraction looks way cheesy. 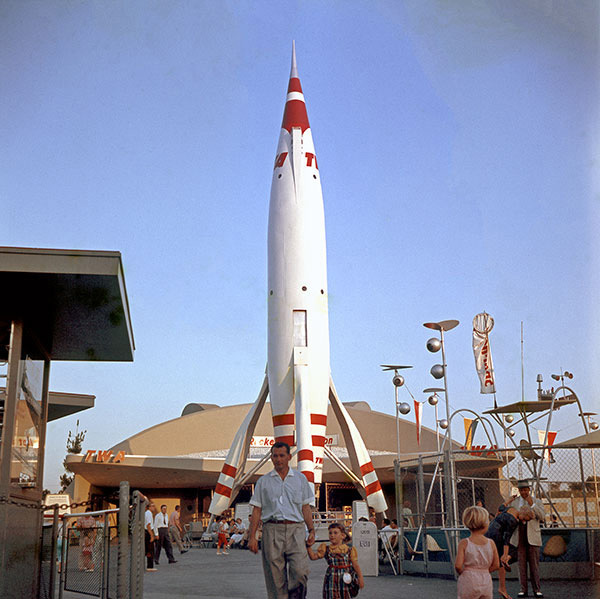 I'd give anything for one of those sculptures/lampposts to the right of the TWA rocket. 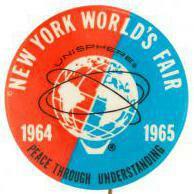 Wasn`t the fact that the N.Y.World`s fair was going on at the same time speed the demise of Freedomland?I remember going to Freedomland on a school trip.One of the guys got stuck in the middle of the Chicago fire re-enactment. Yes, the Fair really helped kill Freedomland. When I met with CV Wood, who had led the project, he said the backers had thought that people coming into town for the Fair would also spend a day at Freedomland. It turned out that distant visitors really didn't know anything about Freedomland and thus spent all of their time at the Fair. Even worse, though, was that locals said "Why go to Freedomland now? It will always be there. I'll see the Fair while I can." As a result attendance dropped past the point where they could keep the place open. He also blamed the NY unions and weather are being far harder to deal with than they had planned. I enjoyed Freedomland. It's too bad it didn't last. It wasn't as elaborate as a Disney park but it was the best thing in the NYC area as far as theme parks. Sort of had to be back then as it was the only one! Is that a little weather station on that platform to the right? Bill, what was that area? It does look like a small weather station. Hard to tell if it was functional or just for display. I believe that area was a small circle where people could fly model airplanes on a tether. I believe that Disney always had the forsight to plant his parks in areas where the weather was warm year round such as Anaheim and Orlando.The New York area attractions had at best 8 months.Four months to six months the N.Y.parks had to lie dormant.I think this was the most important factor leading to the demise of parks such as Palisades,Rockaway Coney Island,Freedomland and even played a role in the visitors to the 2 N.Y. fairs.A visitor to Orlando is still going to spend his time in the parks since between admissions,airfare and hotels his money is already spent.On a rainy summer day the Coney Island amusement area is going to be mostly empty. I don't know much at all about Freedomland, so I researched it and while its creators said the Fair lead to its demise, the writers of the Wiki article offer other thoughts including an accident on a ride just weeks after the place opened (with law suits), an armed theft of money, and a huge lawsuit by Benjamin Moore Paints which, evidently, sponsored some exhibits which were changed against their will. It states that the place was 8 million in the hole at the end of the first season. It is difficult to see, if the place ever really had a viable future, why the Fair would kill it. And why would Freedomland's creators ever think visitors, especially from out of the NY Metro area, would opt to spend a day with them? That sounds astoundingly unrealistic even today. People went to NYC in 1964 or 1965 (as did my family from far away) for the trip of a lifetime--to see the Fair and/or NYC's landmarks--not to hit another amusement park which was not all that well advertised evidently. As for the Fair leading to Freedomland's failure, the Fair was finite. By 1965, it would be gone and a viable amusement park would go merrily on its way long after the exposition was over. It appears Freedomland was not well conceived, had a string of bad luck and threw in the towel without much of a fight. PS: Although I never heard of Freedomland, I had heard of Palisades Park which advertised on WPIX, WOR and WNEW which we received on cable over two hundred miles from NYC. As a ten or eleven year old, I was atuned to every single ad for an amusement park and I never once heard one about Freedomland. And maybe they needed a song like the one which celebrated Palisades Park. As Woody explained it to me, a lot of Disneyland visitors were from out of town and they assumed the same thing would be true in NY. However, as I pointed out and he sadly agreed, Walt had this great little TV show every week that drummed up a lot of interest from people all over. Freedomland did not. He basically agreed they had overlooked that and a few other things in their rush to beat others to market. I get it. I mean, that all makes sense. Just one more question: Who, exactly, did they beat to the market? I do not recall any other major amusement parks opening at that time. In fact, by the end of the 1960's, such parks were closing. The only new park--in the metro area of NY-- I can think of is Great Adventure in NJ. I believe a number of firms had floated the idea of getting into the NYC area, so there was a bit of a race to be #1. Not that anyone then wanted to be #2 after seeing what happened to #1! We all had heard of Palisades Park thanks to The 1962 Freddie Cannon song. I don't think there's any reason for most of us to have heard of it back then if it wasn't for the record. Interestingly, the folks who purchased and revived Canobie Lake Park here in Salem, NH (back in 1958) were people who had consession rides at Palisades Park and were looking to buy their own park. They still own Canobie today. I remember, when I was a kid, my father saying how Disney had it made with that free hour of national advertising each week. "Palisades Park" is a song written by Chuck Barris and recorded by Freddy Cannon. A tribute to New Jersey's Palisades Amusement Park, the song is an up-tempo tune led by a distinctive organ part. It also incorporates amusement park sound effects. Barris wrote a song about an amusement and it was suggested he use the name of an amusement park as the title. One night he was in Manhattan when he looked toward the New Jersey Palisades Cliffs, on which the amusement park sat. That was when inspiration hit and the title was added. The Palisades Amusement Park closed on September 12, 1971. Funny story from Chuck Barris about he used the money from the Palisades Park hit song, to fund an upgrade from a motel to a Bevery Hills Hotel bungalow in Los Angeles, and that in turn got him the break he needed in California. Just to calibrate non-regional awareness - how many people here from New York ever heard of Riverview in Chicago? I'm not from New York or Chicago, and haven't heard of Riverview Park. But in a Google search, it looks interesting. I remember Palisades' own jingle: "Palisades has the rides; Palisades has the fun; so come on over. Shows and dancing are free; So's the parking so gee, Come on over. Palisades from coast to coast where a dime buys the most, Palisades amusement park swings all day and after dark...."
I would bet their ads flooded WPIX for decades. Nope, never heard of Riverview 'til just now. And I only heard of Kennywood, as a kid, because my mother was from McKeesport - just up the Monon from Pittsburgh. ALWAYS considered myself lucky to have grown up in a small town that had a great amusement park like Canobie, though. Even as kids, we all sort of realized how lucky we were to have Canobie in our town. It was like having our own personal amusement park. Still is. That's kind of a bad picture of the Freedomland exhibit. As a kid, if you were walking around at a park, and saw a Giant UFO sitting on the ground, you'd lose it. You want a UFO? 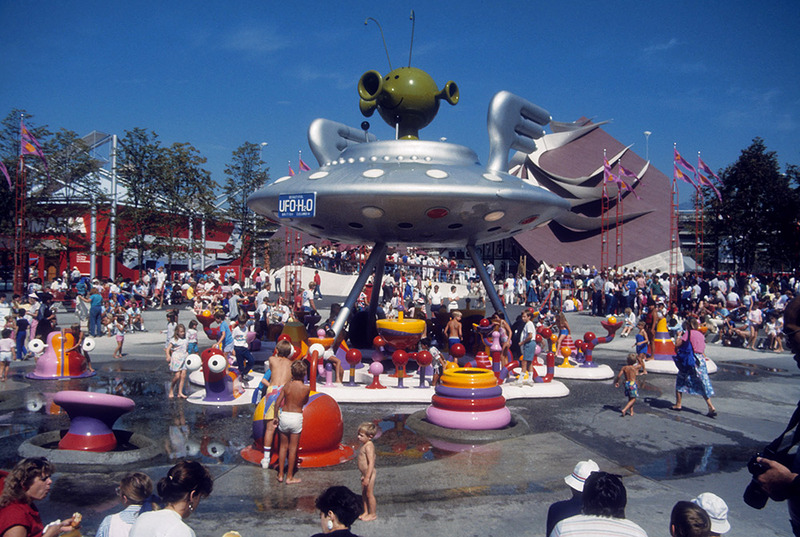 How about this one at Expo 86? By the way, that Freedomland shot was a souvenir slide, so even the official photographers couldn't make it look great. Nah, that one's too small. What is the location of that spaceship thing? 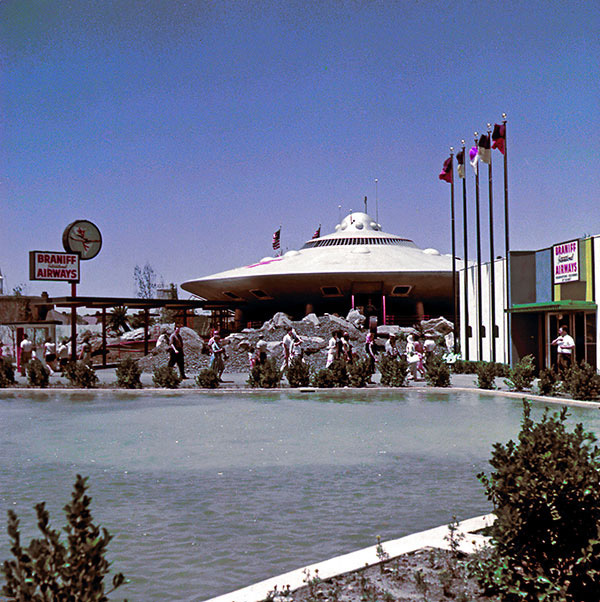 The UFO (spaceship) was parked at Freedomland USA in New York. It was sponsored by Braniff Airways. 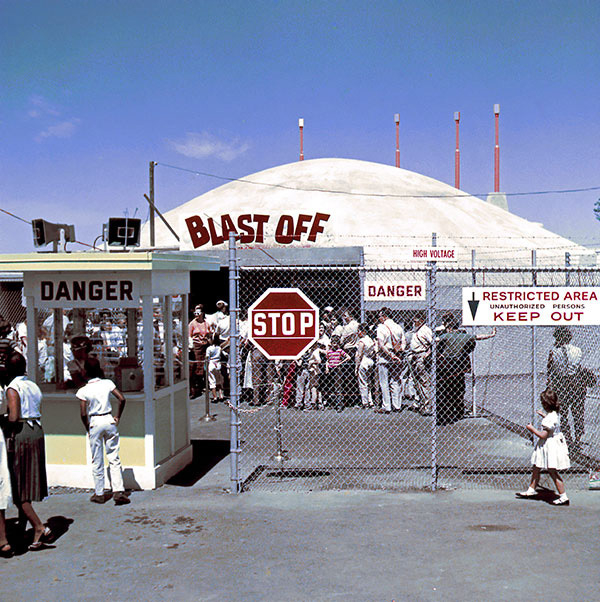 After Freedomland closed, it took off for Omega Centra. Two different exhibits. 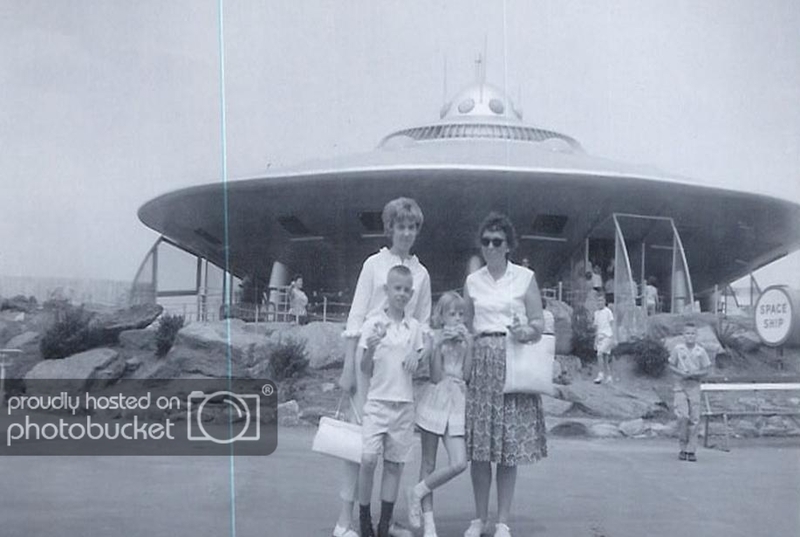 The one I posted was a simulated blockhouse at Freedomland, not the Braniff UFO. Ah, that makes all the difference. I couldn't quite orientate where that was at Freedomland. The giant UFO was quite impressive.